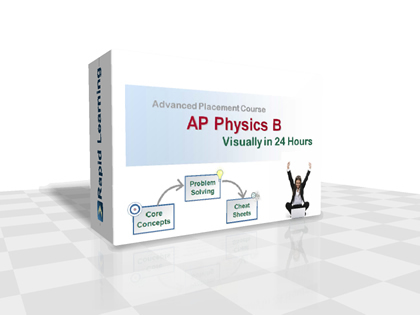 The AP Physics Rapid Learning Series is designed for high schoolers who are taking algebra-based AP Physics B, which mirrors the traditional one-year AP curriculum. There are two AP Physics curriculum - B and C. While majority of AP programs offer Physics B for more completed and better balanced coverage on all college-level physics chapters without requiring calculus, some AP programs also offer calculus-based Physics C on Mechanics and Electricity/Magnetism units only for physical science and engineering bound college prep students. This rapid learning course is one of the most relevant AP courses in the market, with topic-by-topic match to the official requirement. Go to the official CollegeBoard website and download the AP Physics Course Description and compare its content outline with our curriculum. Also cross reference the TOC of your AP physics text. You will find that our course has the complete coverage on required topics one-to-one. Study what you need to study for the AP course and the AP exam. Prerequisites: Algebra I, Geometry and Integrated Algebra II (Algebra/Trigonometry combo). Standalone Pre-Calculus or Trigonometry would also be desirable if your Algebra II does not include trigonometry. Rapid Learning offers all of the above prerequisite courses for fast re-learning or quick review. Single chapter visual tutorials with visualization/animation on screen and narration by physics master teachers and college professors, with focus on both core concepts and problem solving. Feedback based Quizzes are interactive problem drills with summary reviews on all problems and scoring system to track your performance. These single-sheet chapter cheat sheets enables the mastering and memorization of key physics concepts and formulas much more manageable. One sheet per chapter in professionally formatted sheet in printable PDF. These mini-eBooks are the printables on the core concepts videos, for offline reading for concise and quick review on what you have learned from the visual tutorials. Its well-formatted layout makes a clear printing and easy reading. Would you like to learn anywhere anytime on-the-go? These AudioBooks are your perfect learning companion when jogging, driving or in-between breaks, with your iPod/iPhone, SmartPhone or MP3 player. Reinforce your visual learning with audio and exercise to recall your knowledge without looking at the visual. This rapid learning series will empower you to master physics with less time and longer retention.